> For sample verses from the translation by Leicester Ambrose Sawyer, click here. Publisher: John P. Jewett and Company: Boston. References: Chamberlin 554-1, Hills 1687; Herbert 1918; Taliaferro-BVE CN00107, Taliaferro-EELBV 7590.100. 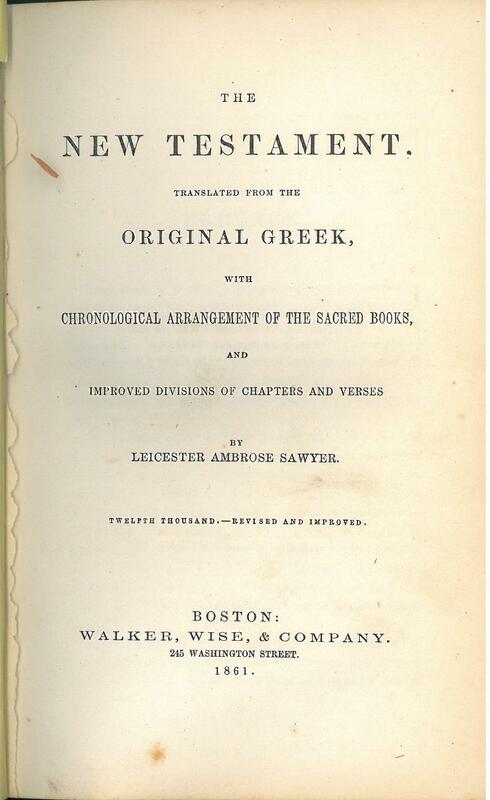 Facsimile: A pdf facsimile of the 1858 edition is available at archive.org. 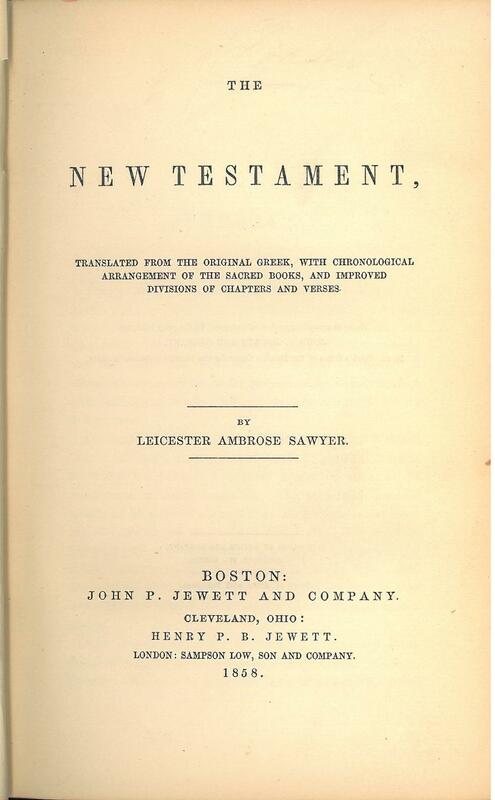 Title: The New Testament, translated from the Original Greek, with Chronological Arrangement of the Sacred Books, and Improved Divisions of Chapters and Verses by Leicester Ambrose Sawyer. Eleventh Thousand. - Revised and Improved. Boston: Walker, Wise, & Company. 245 Washington Street. 1860. Publisher: Walker, Wise, & Company: Boston. References: Chamberlin 554-1, Hills 1687; Herbert 1918; Taliaferro-BVE CN00107, Taliaferro-EELBV 7590.110. Facsimile: A pdf facsimile of the 1860 edition is available at archive.org. References: Chamberlin 554-1, Hills see 1687; Herbert 1918; O'Callaghan 368-6, Taliaferro-BVE CN00107, Taliaferro-EELBV 7590.120. Facsimile: A pdf facsimile of the 1861 edition is available at books.google.com. Title: The Holy Bible, containing the Old and New Testaments. 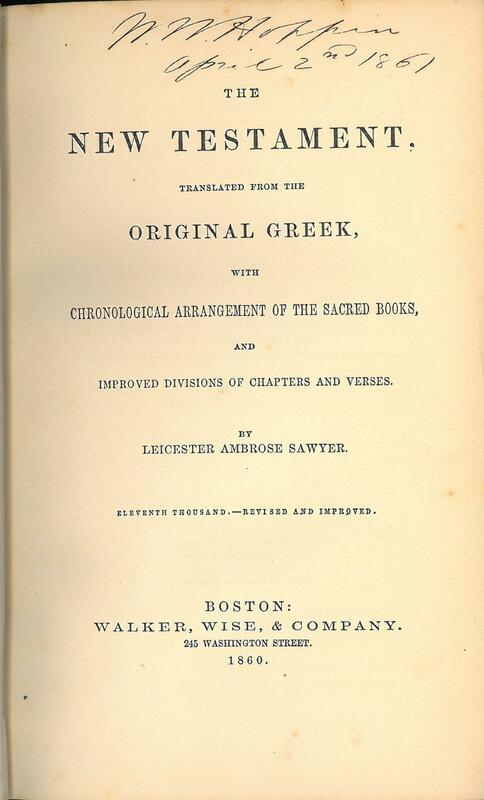 Translated and Arranged, with notes; by Leicester Ambrose Sawyer. Vol. II. The Later Prophets. References: Hills 1745; see Herbert 1918, Taliaferro-EELBV 7590.125. 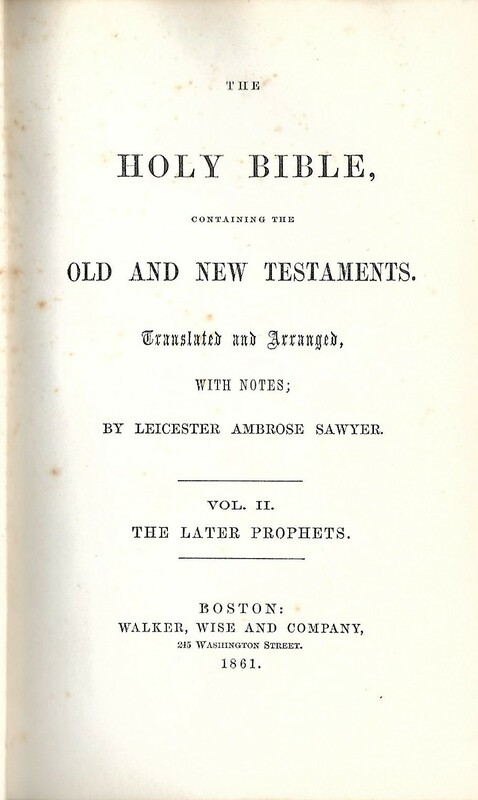 Facsimile: Volume II of the Old Testament can be read online and downloaded from Google Books.